The Solo film has its own 'making of' book which features lots of amazing concept art and design pictures and stories from the production. Industrial Light & Magic Presents: Making Solo: A Star Wars Story is an eyewitness account of the film’s production from visual effects supervisor and co-producer Rob Bredow. The book gives readers an intimate glimpse into the journey that Solo took from pre-production, production, and post-production, fully documenting how this film came to the big screen. 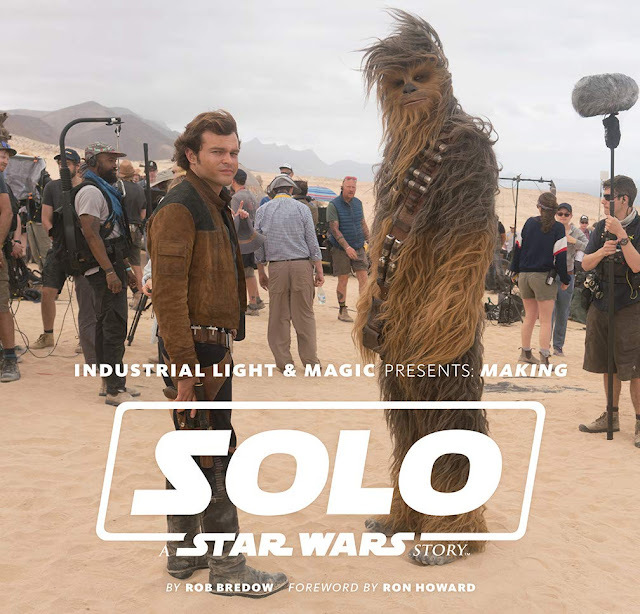 Making Solo gives a chronological overview of how this multiple-Academy-Award-winning visual effects company created new worlds, aliens, droids, and vehicles for a galaxy far, far away, including insights into how the train heist on Vandor, L3-37, the Kessel Run, and the reimagined Millennium Falcon were brought to life. A must-have for Star Wars fans, this authorized, all-access book will be an indispensable work for all movie fans and devotees of popular culture. Rob Bredow is the Executive Creative Director and Head of Industrial Light & Magic (ILM) who runs the company with a particular focus on the creative strategy for the storied visual effects company. He brings an innovative focus to the role, with a background in technology and hands-on experience both as a visual effects supervisor, technology executive, and production partner. Bredow recently served as the Visual Effects Supervisor and Co-Producer on Solo: A Star Wars Story. He served as a creative partner to the filmmakers throughout the production, from the earliest story meetings to the final frames of visual effects. He leveraged his background in innovative technology to help tell the story of the film, creating grounded images with a unique shooting style designed for the movie. Bredow joined Lucasfilm in 2014 as Vice President of New Media and Head of Lucasfilm’s Advanced Development Group. He helped launch ILMxLAB in 2015 and co-wrote and directed Trials on Tatooine, a story-based virtual reality experiment created in collaboration with Lucasfilm’s Story Group, ILMxLAB and Skywalker Sound. In his former role as Lucasfilm Chief Technology Officer, Bredow oversaw all technology development for Lucasfilm and ILM. So he's no slug and Solo was just nominated for an Oscar for Best Visual Effects so his book is sure to give great insights. Order your copy from Amazon.